The two-seat EuroFox is a member of the new breed of light sport aircraft designed for fun recreational flying. Factory-built in Europe, it is powered by an 80-horsepower Rotax 912 four-stroke, four-cylinder engine. More than 225 EuroFox aircraft have been produced. In manycountries it?s rare nowadays to meet someone who has never flown. But whilehundreds of millions of people fly regularly on commercial aircraft, airtransport is just one of aviation?s many facets. Someaviation activities, such as hang-gliding, helicopter sightseeing and skydiving,are largely recreational. Others?including tasks as diverse as pipelinepatrolling, banner towing and international medical evacuation?support a wide varietyof commercial, research, life-saving and law enforcement functions. One sheriffin the United States uses his own ultralight aircraft to look for marijuanafields, said Cass Howell, chairman of the Department of Aeronautical Sciencesat Embry-Riddle Aeronautical University. Aviationhas transformed and itself has been transformed by the daily lives of peoplethroughout the world. Sao Paulo, Brazil has more than 600 helipads because its wealthiestresidents travel in helicopters from their walled residential compounds toavoid being kidnapped on the roads, noted Howell. Throughoutthe developed world people rely on reports from news helicopters and otheraircraft to provide them with up-to-the-minute information on traffic jams,breaking stories such as O.J. Simpson?s notorious ?slow speed chase? ?which wasfollowed by 26 news helicopters?and alerts regarding severe weather. The U.S.Air Force Reserve Command?s ?Hurricane Hunters,? flying WC-130J Herculesaircraft, are the best-known severe-weather chasers. During each year?s Atlantichurricane season, they fly into every tropical depression, storm and hurricanethat approaches the U.S. coast. Many otheraircraft perform vital weather research and storm-tracking activities. Few involvedwill forget how news helicopters tracked an enormous F5 twister as it made itsway towards Oklahoma Cityon May 3, 1999, providing thousands with vital advance warning of the deadlymenace they faced. U.S. AirForce pilots have flown F-4 Phantoms and other fighters designed to withstandhigh g-force loads right into thunderstorms to conduct research into turbulencewithin storm clouds and to learn more about the effects of lightning strikes onaircraft. All upper atmosphere research, such as radiation collection fromnear-Earth space, requires aircraft. Researchaircraft also include NASA?s famous ?Vomit Comet?, aKC-135 that flies in parabolic arcs to give astronauts experience of working inweightless conditions. Nowadays, students and their teachers get to fly in theaircraft too. Industryinsiders use the term ?general aviation? (GA) to describe aviation activities otherthan airline and military flying. One significant GA trend is the developmentof very light jets for private use and for point-to-point commercial flights byair taxi operators, said Howell. Another, ?reallyblossoming,? is production of light sport aircraft weighing 600 kilograms(1,320 pounds) or less for recreational flyers. ?There areprobably dozens of new manufacturers? that make light sport aircraft, saidHowell. Small Rotax two-stroke or four-stroke engines are ?very popular? choicesto power these aircraft and many models are equipped with ?simple butsophisticated? instruments such as GPS receivers. Tracingtheir ancestry to ultralight aircraft, light sport aircraft have developed as aclass since the FAA authorized a standard method several years ago forcertifying such aircraft and their pilots. ?The goalwas to get more people into flying,? said Howell. ?Rules and certification hadbeen getting more onerous and the goal was to reverse that trend.? While recreationalflying is enjoyed by hundreds of thousands of people in North America,thousands or even millions rely on aviation in running their businesses. Oneimportant but often overlooked area of aviation is agricultural flying. ManyNorth American farmers rely on specialized ?ag? aircraft to sow, fertilize andspray insecticides on their fields. 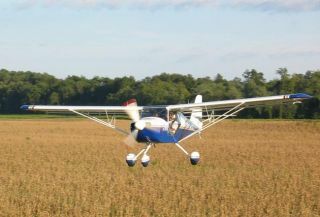 It?sfascinating to watch a single-seat, highly maneuverable ag aircraft zoom lowacross a field, pull up sharply and then return for another pass as it flies aprecision pattern that ensures the aircraft sprays every square inch of thefield. Today,farmers can employ visible and thermal aerial photography to build mosaicimages that show the different soils and soil conditions in every part of afield, said Howell. Employing aGPS-driven applicator, a farmer can use detailed aerial photography to fertilizeevery part of a large field optimally. Different fertilizer blends can beapplied to areas as small as 40 square meters. ?If you canincrease the growth yield of a field by 10 percent over hundreds of acres, thatmakes a remarkable difference,? said Howell. The U.S.Department of Agriculture?s Agricultural Research Service realized it madesense to install thermal cameras and sensors in agriculturalaircraft themselves to collect data as they flew precision-sprayingpatterns. Experimentsin the Mississippi Delta have proved that ag aircraft flying thermal imaging missionscan identify active fire-ant mounds for biological control purposes. And agaircraft taking low-altitude visible photographs were able to detect harmfulalgae in catfish production ponds. But, in Howell?sopinion, aviation?s ability to transport just about anything from anywhere inthe world to anywhere else within 24 hours?particularly perishables?has beenits biggest unsung contribution to society.